Last year, Rockchip RK3288 was always going to be popular, since it offered a massive performance upgrade compared to its predecessor (Rockchip RK3188) with Cortex A17 cores replacing Cortex A9 cores, and a Mali-T764 GPU replacing an aging Mali-400MP4 GPU, plus the addition of 4K video output and decoding, as well as H.265 video codec support. So many manufacturers got involved that I decided to write a list of RK3288 TV boxes and sticks. Rockchip RK3368, the company’s new “flagship” processor for 2015, is a bit less exciting despite providing eight 64-bit ARM cores, since Cortex A53 cores are significantly less powerful than the Cortex A17 cores found in RK3288, and the performance of the PowerVR G6110 GPU used in the processor is a bit of an unknown for now. RK3368 might still rank pretty well in benchmark since it comes with eight cores instead of four cores, but I’m not convinced it will really show during normal use, although the upgrade to Android 5.1 on the newer processor may also help. The main improvement is probably support for 4K @ 60Hz video decoding and output (HDMI 2.0), which was not possible with RK3288 and lower end 4K UHD televisions. Pro – 1 GB RAM, 8 GB flash, Fast Ethernet, Wi-Fi 802.11 b/g/n and Bluetooth, 3x USB 2.0 host ports, 1x micro USB OTG and HDMI 2.0. Price: $75 on GeekBuying. Meta – 2 GB RAM, 16 GB flash, Gigabit Ethernet, Wi-Fi 802.11 b/g/n/ac and Bluetooth, 3x USB 2.0 host ports, 1x micro USB OTG and HDMI 2.0. Price: $99.99 on GeekBuying. Model 1 – 1 GB RAM, 8 GB flash, Fast Ethernet, Wi-Fi 802.11 b/g/n and Bluetooth, 2x USB 2.0 host ports, 1x micro USB OTG and HDMI 2.0 & composite (RCA) output. Price: $70 on Aliexpress. Model 2 – 2 GB RAM, 16 GB flash, Fast Ethernet, Wi-Fi 802.11 b/g/n/ac and Bluetooth, 2x USB 2.0 host ports, 1x micro USB OTG, and HDMI 2.0 & composite (RCA) output. Price: $96 on Aliexpress. 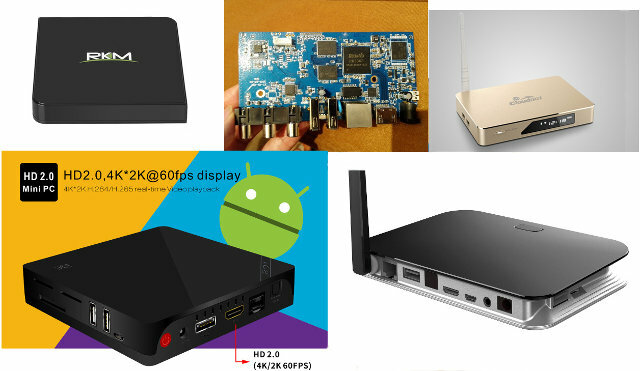 Zero Devices Z64 – TV box apparently based on CSA90 “Model 2” but with Gigabit Ethernet. Price: $125 on Asiapads. CloudnetGo CR13 Plus – TV box with 2 GB RAM, 8 or 16 GB flash, Gigabit Ethernet, Wi-Fi 802.11 b/g/n/ac and Bluetooth, 3x USB 2.0 host ports, and HDMI 2.0. Price: TBD. CloudnetGo CR18 – TV box with 2 GB RAM, 8 or 16 GB flash, Gigabit Ethernet, Wi-Fi 802.11 b/g/n/ac and Bluetooth, 3x USB 2.0 host ports, and HDMI 2.0 & composite (RCA) outputs. Price: TBD. X6 – TV box with 1 GB RAM, 8 GB flash, Fast Ethernet, Wi-Fi 802.11 b/g/n and Bluetooth (Maybe), 2x USB 2.0 host ports, and HDMI 2.0 & composite (RCA) outputs. Price: $57 on Aliexpress. Note: X6 model was supposed to be for the Chinese market, but the few who bought appear satisfied. Himedia H7 III – TV box with 1 GB RAM, 8 GB flash, Fast Ethernet, Wi-Fi 802.11 b/g/n, 2x USB 2.0 host ports, and HDMI 2.0 & composite (RCA) outputs. Price: $89.89 on Aliexpress. The firmware is likely in Chinese only (TBC). All boxes run Android 5.1, and prices when available including shipping. The cheapest and lower end model is X6 selling for $57, with other 1GB RAM/8GB flash boxes selling for around $70. The best devices in terms of features appear to be Rikomagic MK68 and Tronsmart Orion R68 Meta both with 2GB RAM, 16GB eMMC flash, Gigabit Ethernet and 802.11ac WiFi, and selling respectively for $100 and $112. For reference, their Rockchip RK3288 equivalent, namely Tronsmart Orion R28 Meta and Rikomagic MK902 II sell respectively for $115 and $113. So far, nobody appears to have come up with a Rockchip RK3368 HDMI TV stick. Not sure whether the cause is fading demand for sticks, the CPU gets a little too hot, or we just need to be patient. Corrections and additions to the list are more than welcome. They still seem to be a little on the expensive side, especially since most have just 1GB of RAM. This is how it always was with a new SOC though so in a few months prices should come down. Hallo, is USB 2.0 enough to play 4K content? I dont understand why none of these boxes have USB 3.0 or sata connector. Yes, USB 2.0 is fast enough to play 4K content. 4K Blu-ray peak rate is 100 Mbps, while USB 2.0 theoretical throughput is 480 Mbps. I normally get around 30 MB/s read speed on USB hard drives (around 240 Mbps). These boxes don’t have USB 3.0 or SATA because Rockchip decided not to support it in their SoC. Interesting that the (rk3368) cortex a53 is less powerful than the (rk3188) a9 or (rk3288) a17, yet can do 4k! Nobody uses cpu to decode video these day. Hell, you would need an i7 to do a 4k decode using just the cpu. You mentioned that RK 3368 has support for H265 video codec. Does that include support for 10bit H265 as well? Some companies want to sell me samples, but they delayed either because of production issues or because their current models only support 10/100M, and by the end of the month they’ll get Gigabit Ethernet. Maybe. I’ll need to test it. I can only test whether it can decode 10-bit HEVC, but I don’t think I can test whether it outputs 8-bit or 10-bit colors. Received the Beelink i68 and testing showed that the shipped firmware did not support [email protected] HDMI 2.0 output. I am in contact with the company and they said they would be releasing new firmware to fix that. I’m hopeful, but why would they have advertised 4K UI output when they obviously haven’t tested it? I don’t think the UI will be at 4K, this requires a really good GPU for acceptable performance. 4K should be for video output, video playback, and maybe photo display. Himedia H7 III it’s only for chinese market. The BIG missing of RK3368 is Audio HD (no hardware support) … so: no Audio HD no party! The prob with Hi media is there is no support from them. Only one firmware with bugs and that’s it. I would not touch their devices with a bargepole….ever again. The company is assuring me that it will do 4K UI after the firmware update. Curious if you think the RK3368 will be able to support a simple android app in [email protected] Many mobile phone processors can push that many pixels (maybe not at 60hz) – how about this processor? Another one: iView A8 for $76 @ http://www.aliexpress.com/store/product/Octa-Core-Smart-TV-Box-iview-A8-4K-H-265-Android-5-1-OS-1G-8G/313543_32419529783.html . Maybe the same board as X6 with a difference case. from fist test Himeida H8 IV have audio HD support , very straying. Audio HD 7.1 passthrough work external player and/or kodi internal(dvdplayer) ? ZIDOO rk3368 support Adjust display refresh rate to match video 24/50/60 and 23.976 fps with KODI? Support 4K HEVC 10-Bit it’s big news! 1080p h.265/h264 10 bit? Thank God Zidoo is finaly giving up on the Allloser and MStar Weakling-SOCs. Hurray for picking something powerfull this time. It’s a model with 2GB RAM, 16GB eMMC, 802.11ac and GbE. from freaktab and minixforum report: “RK3368 – It does not support 10bit HEVC, confirmed this with RK.” Zidoo X6 have new/special firmware? good news , without stutter ? MXVI (MX6) is low end RK3368 box with 1GB RAM/ 8GB flash, 10/100M Ethernet, 802.11 b/g/n. Price starts at $64. Beelink R68 appears to be based on Beelink i68, but an external WiFi antenna replaces the power button, and instead of plastic, the case is made of metal. HiMedia H8 (Octa Core) is another one (16 GB flash, 2GB RAM, metal case), and contrary to H7 III I understand it’s for oversea markets. Probably an existing hardware platform however, but different firmware.